Hi, I'll be your Angel of Death for today. 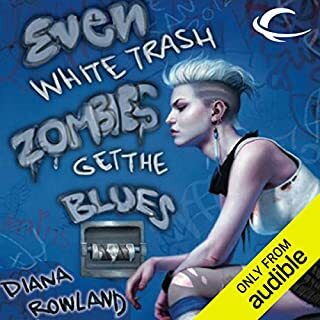 Would you consider the audio edition of Even White Trash Zombies Get the Blues to be better than the print version? Yes, I'm in love with Allison McLemore's voice. Even though I'm rebuying these on my nook soon, I'm always going to come back to listen to these. And highly recommend book lovers to try both. Listen while reading along, or enjoy both separately, a good book is worth multiple verisons, (at least in my imho). 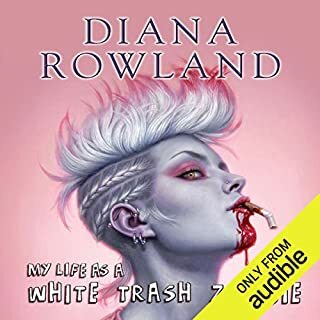 What other book might you compare Even White Trash Zombies Get the Blues to and why? So far I haven't found anything quite like this, closest I could think of would be the Anita Blake series. But I'm far from a book know it all, so there's probably more, and I'm going to be on the look out for such! Angel, though I love Allison's male voices, mainly when she did Kang's, but Angel's still the best even when she's decayed and zombiefied, Brains!
" And I thought becoming a zombie was the worse thing yet!" If you've read, or listen to the previous book, you know what your in for. It's funny, its exciting, and however gross, you'll probably learn a few things. Interesting characters, great interactions, and a reader that I'm personally in love with now. This takes up right after the last book, so the first one is a pretty much need to read so you won't get lost, and ends in a great way! Even though this didn't ask "My favorite scene", I'm going to say it anyway, without spoiling anything. But Ed's 'ace up the sleeve', was epic. I'm a horror fan, story lover, and with my group of friends, the go to for any kind of story (book, comics, movies, whatever). And that scene made me go "Epic!, Never would have thought of that!" As a southern born and raised in Georgia, the southern voices didn't annoy me and go "wait we don't sound like that! ", so again, I can't highly recommend this book enough. If you liked the first one, you'll fall in love with this one even more. Would you listen to The True Story of the Three Little Pigs again? Why? Yes, and will listen to it often. I first found this book during a book drive thing our school did when I was a kid. Its only seven minutes and done amazingly well by famed actor Paul Giamatti. As a kid, i loved this book, and now all grown up it still makes me giggle. I will keep returning to this, and since its so short I may just take out my earbuds and get others to listen to. Its just that kinda story I'm sure will at least make you giggle in a couple parts. Which character – as performed by Paul Giamatti – was your favorite? 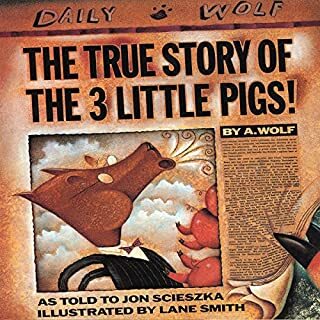 If your a child, or child at heart, you should know the story of the three little pigs. And BOTH sides of the story should be told. My only complain is your paying about a dollar a minute, but since it has music, and Paul brings his best to the mic, it's still debatable if it should be cheaper or if the price is right. Either way, I think its really worth a listen. And anyone who is disappointed believes the three little pigs' side anyway!